Why does Meet Me in St. Louis continue to resonate after so many decades have passed? The film was directed by Vincente Minnelli in the 1940s and it was set just before the 1904 World's Fair in St. Louis, yet we still love the movie and screen it and watch it. Is it because we're fond of the songs? "The Trolley Song" and "Meet Me in St. Louis, Louis" certainly are catchy. 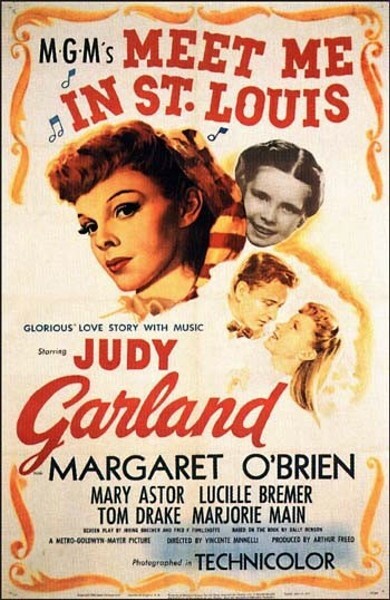 Perhaps we enjoy hearing Judy Garland sing these tunes — she does do a lovely job with them, no doubt about it. Or maybe we just take pleasure in seeing our fair city featured prominently and positively during a simpler time, a time during which people seem happy and proud to be here, in good, old St. Louis. Of course, there are lots of proud St. Louisans today, and we imagine a great many of them will gather on Art Hill in Forest Park for the Saint Louis Art Museum's screening of Meet Me in St. Louis, the final film in the museum's "Outdoor Film Series: The Magic of Vincente Minnelli." The movie will begin at 9 p.m., but you might want to arrive a bit earlier to stake out a spot on the hill and even stroll around inside the museum (314-721-0072 or www.slam.org), which is open until 9 p.m. on Fridays. Admission to the outdoor event is free; bring along a blanket and snacks if you wish.